I have seen your YouTube video advertisement... What is a “cocky“? A “blocky“? A “Bitumen Jockey“? ‘Blocky’ is a name describing the burgeoning small rural-block owners with rural homes on a few acres. ‘Bitumen Jockey’ is Australian slang for a Townie, A Suburb or City-dweller. The point being made is that no matter what type of swing or slide gate that you have, SUN-POWER Auto Gates can provide you with an excellent Automatic solution. Will a solar-powered gate operator work at night? Yes, the solar-powered gate operators sold by Sun-Power Auto Gates will work at night. Their design incorporates a powerful 12v, 9AH battery which is charged during the day thanks to the solar panel included in the Kit. With a fully charged battery, it is expected that the XP Series gate operators should work up to 10 days at 10 cycles per day without any solar charge. 23 Years is the longest recorded installation, which at an average of 8 cycles per day has racked up over 50,000 cycles. However, at an Industrial Installation in NSW, the XP Series has operated approx. 50,000 cycles per year over three years, making it the best performer with a total of over 150,000 cycles. My engineer friend says the lever-arm mechanism of your swing-gate operator is more suitable and stronger than many of the piston-type/ram-type operators available online, especially the cheaper ones. But my interior designer loves the piston-type. I'm confused. Do you sell the piston-type? Are they good? We like your engineer-friend’s opinion. 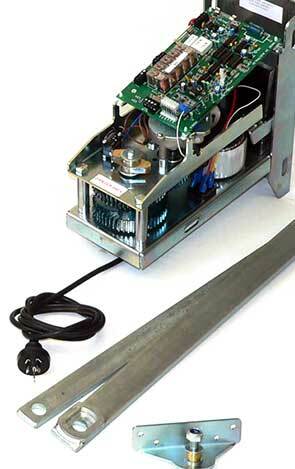 No, we do not sell the Solar-powered worm-screw drive type of gate operators. They may be OK for small, light-duty-access solutions, but for long-lasting, true heavy-duty-cycle grunt-work (day-in-day-out), there is no doubt that the lever-arm operator type is superior. We believe the XP series are the strongest & best gate operators on the market in Australia. Are the XP Series Auto Gate Operators imported? If so, where from? Your gate kits are described as 'DIY'. Do I need any special skills to install one? Many of our customers are comfortable following the comprehensive instruction manual and installing the kit themselves. A few years back, a 70 year old lady in NSW did her own installation and did a great job of it. Other customers contact a variety of handy-people to install their kits. A large number of our sales are to DIY installers. Your local handy-man, mechanic, fencing contractor or friend who is an enthusiast and fairly practical should be OK installing a gate operator. If you are unsure of who to get to install your kit, feel free to contact us, as we may have a Dealer in your area. How do visitors gain entry through an automatic gate? Sun-Power ‘XP Series’ Auto Swing Gate Kits currently (Nov 2016) come with a BONUS OFFER which includes 2 FREE Wireless Key Pads; 1 for Entry plus 1 for Exit. These can be mounted on posts at the entry and exit approach to allow use without leaving your vehicle. Note: Currently (Nov 2016), these keypads can be exchanged for 2 x PBRAD2 push-buttons with 2-position key-switch (not everyone wants their visitors to have to remember a 4-digit code to gain access). All Sun-Power Auto Gate Operator Kits have 3 Remote controls, however the current BONUS OFFER provides TWO extra Remote Controls FREE so you get a total of five. Also supplied FREE are 2 Wireless PIN-Code type Keypads.